Design and Manufacture | Design, Supply and Erection of fully integrated building solutions using Glulam Engineered structures. Curve radii with an inner radius above 3500 mm are possible. Technical support and valuable advice by means of experienced personnel. Lamination thickness varies depending on the shape created and intended use. All types of arches, cambers, and even 3-dimensional bends are possible. Curved beams up to 33.5 meters in length. The fascination of glued laminated structural timber lies in the possibility to freely shape the Glulam components while maintaining a high load-bearing capacity. No other building material permit’s the forming of equally numerous geometric shapes as with glued laminated structural timber. 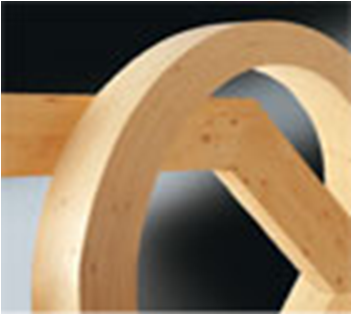 Simple shapes such as pre-camber, arches of all types or shaped beams are covered in the range. Double-glued cross sections, finger-jointed beams and framework trusses are used in large spans. A high resistance to fire, an excellent load carrying capacity as well as the high resistance against aggressive chemical substances provide the glued laminated structural timber components with a natural advantage when compared to other building materials such as steel or reinforced concrete. Copyright © 2017 Glulam Solutions Ltd. All rights reserved.